The Sueddeutsche Zeitung reports on the next chapter in the ongoing battle between the Bavarian State government (Bavarian Ministry of Finance) and a British publisher, Peter McGee, concerning the republication of historical Nazi newspapers in a reprint series (see the IPKat's earlier post here). The reprint series Zeitungszeugen (in English: newspaper witnesses) came with an outer layer of pages that included commentaries explaining the historical context of the original publication and the Nazis' propaganda tricks. German media has previously reported that the state of Bavaria holds the copyright the relevant Nazi publications, such as the Voelkischer Beobachter, after it took over the rights of the main Nazi party publishing house Eher-Verlag after the end of World War II as part of the Allies' de-Nazification programme. It was also reported that Bavarian state officials had confiscated more than 3,200 reprints of an edition of Voelkischer Beobachter. The publisher of this educational series was not amused. 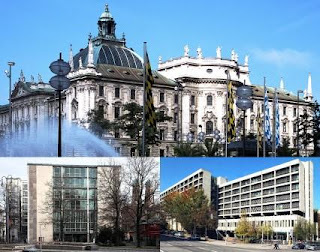 The Sueddeutsche Zeitung now reports that it appears that the the 21st civil chamber of the Regional Court Munich I (21. Zivilkammer, Landgericht Muenchen I) will decide the copyright dispute in favour of the publisher, Peter McGee. While the final decision is expected for 25 March 2009, the presiding judge, Thomas Kaess, seems to have already hinted at the possible outcome, the Sueddeutsche Zeitung reports. Judge Kaess is cited as saying that if the State of Bavaria was interested in stopping such reprints, then it should pass an appropriate law instead of "... poking in copyright law". Moreover, it was doubtful whether the Bavarian State even owned the relevant copyrights, plus these rights may have already ceased to exist. Judge Kaess is further cited as saying that copyright law was, in any case, a difficult basis for the Bavarian State's legal claims. It was further doubtful whether Adolf Hitler had indeed been the editor of the Voelkischer Beobachter, particularly whether he had had the time to contribute to the publication and to take decision as to which articles were to be included in the publication. The mere fact that he had been mentioned as the editor, was not enough to establish a copyright proprietorship in the publication, Judge Kaess is cited. The Sueddeutsche Zeitung also reports that the Bavarian State had apparently, inter alia, referred to a law of October 1933 - and as such a law passed by the Nazi regime - to support its claim of a copyright transfer. While there are clearly some (moral) questions whether such a law can or should be evoked today, it appears that it was not even applicable because the relevant editions of Voelkischer Beobachter were first published in March 1933 before the law came into force. The Bavarian government was a little overzealous perhaps? In the end, a somewhat dull conclusion that copyright expires after 70 years.